BEDCHAMBER GAMES is now on sale! It’s Lawrence Byron’s turn to meet his perfect match. 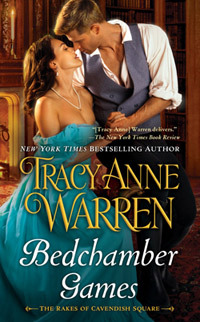 Bedchamber Games, the third and final installment of the Rakes of Cavendish Square trilogy, is available now. Visit the Bedchamber Games page to find out more about the novel and to read an excerpt. Posted in Read All About It | Comments Off on BEDCHAMBER GAMES is now on sale! Read the story description and check out the exciting new cover for Brie Grayson’s book, Mad About the Man (The Graysons, Book #3). Coming 10.6.15. Pre-Order Now! For those of you who’ve been eagerly awaiting books for Leo, Lawrence and Esme Byron, I have great news. I am currently under contract with my publisher to write full-length novels for each of the younger Byron siblings in my new Rakes of Cavendish Square Trilogy. Lord Leo’s book, The Bedding Proposal, will be released March 3, 2015 and is now available for pre-order with Lawrence and Esme’s books to follow. Posted in Read All About It | Comments Off on More Byron stories coming!